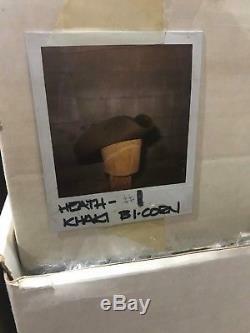 This RARE colonial hat was worn on screen by OSCAR WINNING actor Heath Ledger, as Gabriel Martin in the movie "The Patriot" (Columbia, 2000). 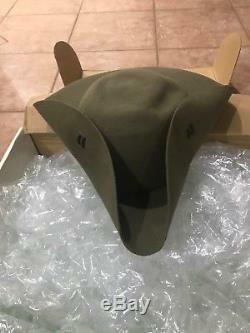 It is a khaki felt hat with the right and left brim folded up. 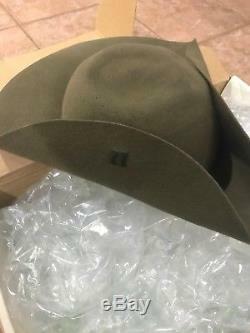 Each side has two laces that secure the brim. 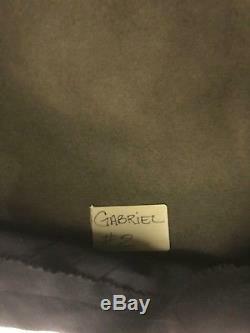 On the underside is a sticker with the name "Gabriel #2" handwritten in black ink. The box (see pics) also has other writing from the studio, depicting scene numbers and actor/character names. 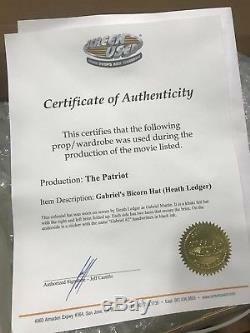 This item comes with the original authentication certificate. 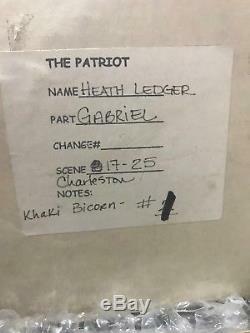 The item "Heath Ledger / Gabriel's Bicorn Hat / The Patriot Movie/ ORIGINAL Screen Used" is in sale since Saturday, November 10, 2018. This item is in the category "Entertainment Memorabilia\Movie Memorabilia\Wardrobe\Originals". The seller is "dnw51317" and is located in San Bernardino, California.